Toxic emote reaction is now +1 positive rep.
Is there no way to go to first unread posts from before the update? I have the option on threads I've read post-update, but not pre. Not 100% sure on this, but there is an "unread content" link at the top of the page, and also in threads there is this indicator as well. I noticed that after I posted. It'll work until I go back through all the threads and get the little icon beside the topic again. Thanks. Where has the reputation page on this forum where you can see all the posts you upvoted/downvoted gone I can’t find it anywhere? Also I’d like the tournaments to not show up in my notifications how do I disable em. Unfortunately, the profile reputation page did not make the cut and was not included for this update, however you can still view breakdowns of the reactions of each individual post. To manage your notifications, you can click "Notification Settings" located on the bell button on your top right. Should be fully customizable if you don't compete in our events. On the whole this update is great, and I like almost everything about it. 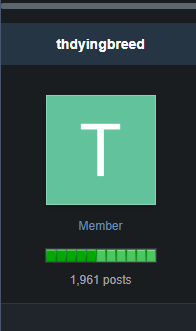 The only gripe I have is the new avatar sizing. If I make the one I was previously using any smaller I lose resolution, if I make it large, and then scale it down using the sites cropping feature, I lose resolution. If I use the same image as I was before the update, the edges are clipped. This is probably my only issue with the new version of the site, but it is a bit pesky. Five +1 options and two -1 options? You mean I can upvote a post 5 times but I can only downvote it twice? I posted Lets goooo on the first page and it was in the editor still when I came back, does it remember last posts? Would it be possible to get the direction keys to cycle through the pages? Great work, guys. Extremely clean and super-responsive. Yep, there is a “clear editor” option though at the bottom of the text box, that will clear any saved text. I can look into it but it wouldn’t be for a while if I’m being honest. Mobile is NICE. I'm loving the update. What's the reasoning behind removing both forum signatures and hyperlinks to users various Twitter and Twitch accounts, etc? I'm not complaining, just curious about the reasoning behind the removal. Both were causing issues with SSL, mainly signatures. We are looking into bringing back signatures possibly though, I have some memes in mine that I want back. But you guys are amazing so it is an acceptable collateral damage. Maybe I am just stupid but is it a reason why the header looks look it is drawn with a free hand? Can we please bring rep back to it’s former glory in the next update...like we don’t even have the green/gold bars anymore nor can we see the total amount of rep we have. We are testing out the new system with "individual reactions" - but he specifically mentioned no green bar and not being able to see his rep.
You can also just click on any reaction to a post and see who/how many people left them. Not anymore, no. We cleaned up some of the groups (we dont offer premium anymore). We might bring it back in the future. I also wanted to say the whole team appreciates everyone that purchased premium and supported the site while we offered the program - really did make a big difference.